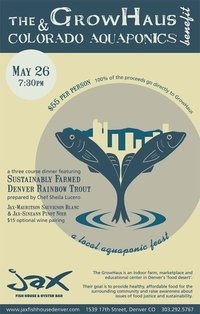 Special thanks to the amazing chef’s and staff at Jax Denver and Boulder for so brilliantly harvesting and preparing the Colorado Aquaponics Rainbow Trout for the GrowHaus benefit dinner. The three course meal was delicious and proves that locally grown, sustainably raised fish and vegetables can easily be prepared to culinary perfection. Jax also donates an ongoing supply of oyster shells used in the aquaponics systems to provide a natural source of calcium and help balance pH.